(April 16, 2014)- Acting on a tip received by SWFL Crimestoppers, Cape Coral Police were able to develop probable cause and make an arrest in a retail theft that occurred on April 3, 2014. Angel L. Torres, H/M, DOB: 10-16-1975, of 2846 SE 16th Place #4, Cape Coral, FL was arrested on Tuesday for one count of retail theft. Original release after the break. (April 3, 2014)- Cape Coral Police need your help in identifying a retail theft suspect. On Tuesday, March 18th, 2014 (Sports Authority) 1810 NE Pine Island Road Cape Coral, Lee County, Florida reported a theft of store merchandise. The manager was notified by store employees that a hispanic male entered the store with a jacket in his hand and that he (the Hispanic male) is the same individual that has been stealing merchandise from the store in the past. The manager walked to the footwear department and engaged in conversation with the hispanic male. Assistance was requested and the manager then needed to assist a customer at which time the hispanic male exited the store with merchandise concealed under the jacket he was holding. The manager then went back to the area where the Hispanic male had been and recovered four empty shoe boxes. 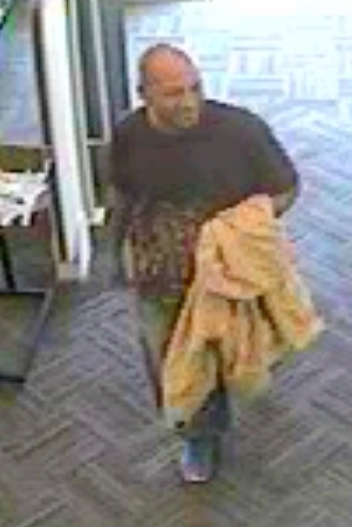 The male concealed the shoes in his waistband and his jacket according to a store employee. The total value of the stolen merchandise is $270. Please take a look at the photos and video above. If you have any information on the identity of the suspect, please contact the Cape Coral Police Department at 239-574-3223. You can also submit an anonymous tip. Go to www.capecops.com/tips or text a tip- text CCPD+"Your Message" to CRIMES (274637). Finally, you can call Crimestoppers at 1-800-780-TIPS.